Northwest of Tibet’s capital Lhasa is a vast, sparsely populated tableland averaging more than 15,000 feet in elevation. Nonetheless, it was here that Tibetan civilization first arose in dramatic form. Recently discovered remains of this ancient civilization can now be associated with a kingdom, culture and language traditionally called Zhang Zhung (pronounced: Shang Shung) by the Tibetans. For more than two decades, University of Virginia Tibet Center archaeologist and historian John Vincent Bellezza has been exploring highland central Asia, going places where few archaeologists and explorers have ventured. 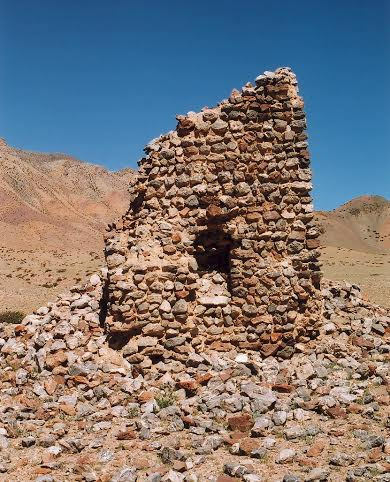 He has investigated and documented scores of monumental sites, rock art, castles, temples, residential structures, and other features on the desolate reaches of the Tibetan Plateau, building a knowledge base on a vast archaic civilization and an ancient religion that flourished long before Buddhism emerged and dominated this otherwise comparatively sparsely populated high altitude region. Some scholars have suggested that Zhang Zhung constituted the historical basis for the mythical legend of Shambhala, the inspiration for the fictional Shangri-La, the popular, paradisiacal utopian society nestled within the Himalayans described in the 1933 novel Lost Horizons. And though far less fantastic, the reality of the Zhang Zhung civilization still invites the imagination. In his books and other writings, Bellezza describes this archaic civilization as flourishing from about 500 BC to 625 AD (Tibet’s Iron Age and aftermath) and encompassing most of the western and northwestern regions of the Tibetan Plateau. Mastering an ancient technology base not normally attributed to peoples of this region in the popular perception, the people of Iron Age Zhang Zhung, according to Bellezza, built citadels, elite stone-corbelled residential structures, temples, necropolises featuring stone pillars, sported metal armaments and a strong equestrian culture, established links with other cultures across Eurasia, and exhibited a relatively uniform and standardized cultural tradition rich in ritualistic religious practice, where kings and priests dominated the highest rungs of power. These are all characteristics of stratified, centralized and developed societies most often associated with the more southerly, lower-altitude Old World Bronze and Iron Age civilizations and the advanced civilizations of Mesoamerica and South America. The supporting findings on the Tibetan landscape, when considered across two decades of investigation, have been nothing less than prolific. Dr. Bellezza’s important research cannot be conducted without generous donations from the public and any sponsoring organizations. Additional resources will be needed before future meaningful progress can be made in illuminating our understanding of this ancient society. If you are interested in donating to this effort, please click on the donate button below and contribute any amount reasonable for your circumstances. We thank you in advance for your generous support!